Attic adaptations have dominated the traditional construction market, becoming a trend in the interior design. Creating a cosy corner under the roof requires the influx of natural light, which in many cases is only possible by applying roof windows. FAKRO also offers products intended for installation in rooms with elevated humidity levels such as bathrooms and kitchens. Appropriate planning in the roof opens up new functional and arrangement possibilities. 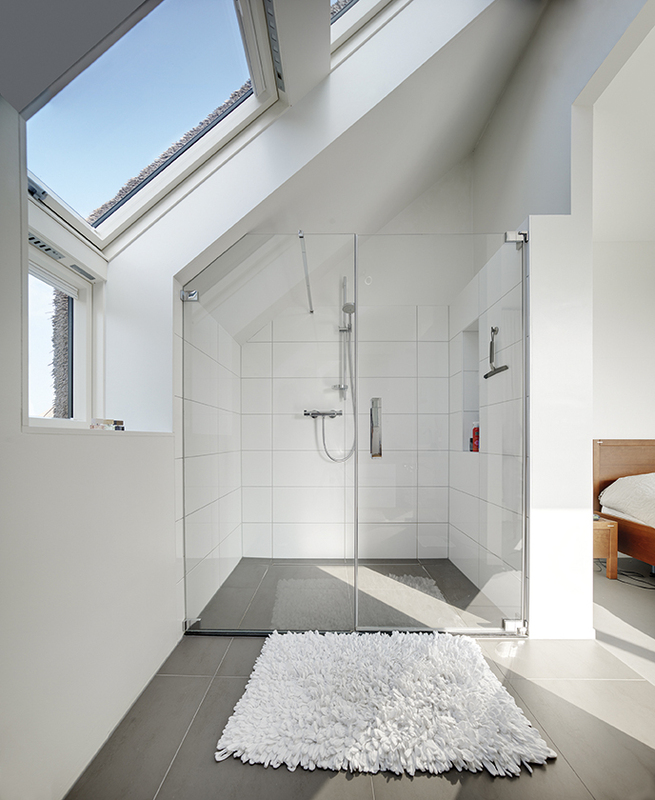 The most common problem when planning a bathroom in the attic are sloping walls on the large surface of the room. In order to provide convenient communication one must keep in mind the appropriate distance in the strategic points of the bathroom. A drawer or a bathtub can be fitted in hardy accessible areas under the sloping wall. When planning the interior one should also ensure the proper choice of colours and finishing materials. By applying a few simple rules one can create a friendly, warm and easy to keep clean bathroom. Colours dominating in this room should be bright to allow creating optically enlarged and lightweight space. It is advised to avoid dark shades and patterned ceramic tiles over the entire length of walls, especially in the sloping areas as this may result in visual overwhelm of the interior. This solution, however, is ideal as decorative element of the wall fragment giving the interior an individual character. 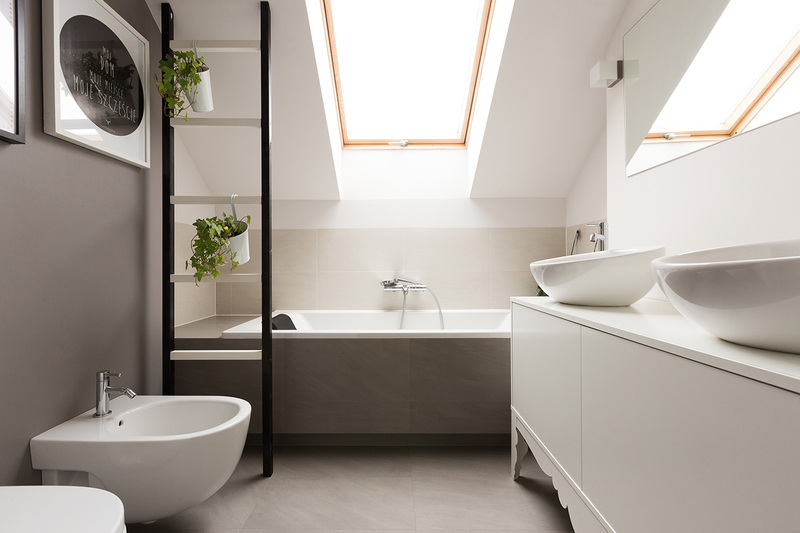 Combining roof windows results in more light in the attic which in connection with white walls will optically enlarge a small bathroom located there. FAKRO windows coated with white polyurethane lacquer are designed for places with elevated humidity levels. Using different finishing materials and colours will give the individual character to each room. The complement of each interior is light which enters the room through moisture-resistant FAKRO aluminium clad-plastic windows. Locating a bathtub under the sloping wall will save the space, while placing a roof window over the bathtub will allow to delight with the stars when taking long evening baths. Minimalism is identified with elegance. In order not to overwhelm the bathroom it is recommended to apply bright and smooth textures on the sloping walls. 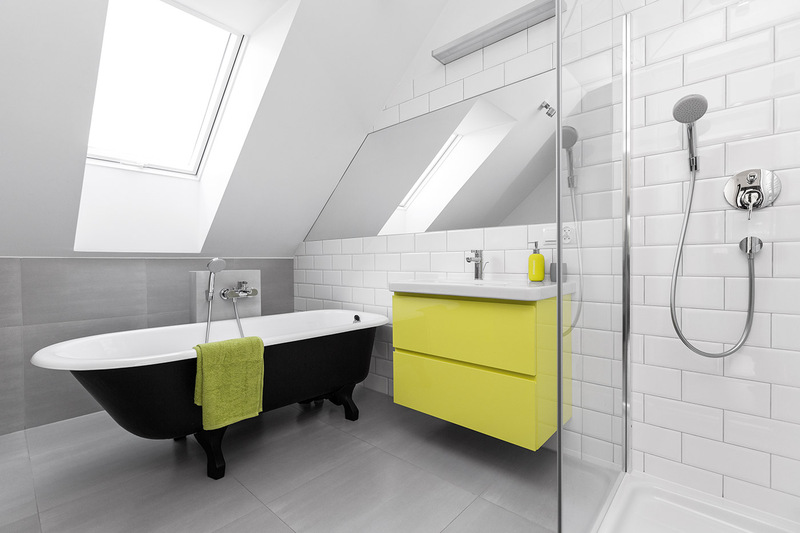 An unusual solution is to situate a child's bathroom under the roof. The wall made of mirrors will optically lengthen the interior, while applying white walls and the influx of natural light through roof windows will additionally increase it.